Three people have been arrested on suspicion of murder after a body was discovered at a flat in Rotherham. The body of the 43-year-old man was found at a property in Badsley Moor Lane at about 00:05 BST on Tuesday. He has not been formally identified. 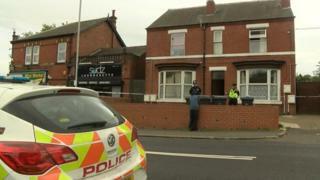 South Yorkshire Police said two men, aged 19 and 23, and a woman, aged 30, had been arrested in connection with the death. The force has not released details about the cause of death.